Figure 1. Concept of optical neural stimulation using localized heating of gold nanorods. (a) Gold nanorods distributed in the vicinity of the plasma membrane of nerve tissues are designed to absorb a light energy. Pulsed infrared illumination photothermally heats the gold nanorods, causing a local temperature increase at the membrane of neural tissues. (b) TEM image showing a cross-sectional view of rat sciatic nerve after injecting gold nanorods. 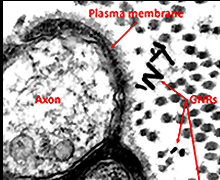 Gold nanorods are located near the surface of the plasma membrane. A variety of stimulation methods have been employed to modulate the activity of nerve cells by means of a local perturbation of extracellular environments. To date, electrical stimulation of neurons has been mainly used because it is well-established in terms of precise quantification, easy controllability and high reliability. However, due to the limitations of invasiveness and poor spatial selectivity, alternative non-invasive techniques have been proposed such as ultrasound stimulation, magnetic stimulation, optical stimulation, and optogenetic method. Among them, the optical stimulation has been spotlighted in modulating a neural activity because light waves in visible and infrared bands can be delivered to the target area via artifact-free, damage-free and contact-free stimulation. In particular, infrared neural stimulation (INS) is gaining an increasing attention owing to its advantages such as large penetration depth and high spatial selectivity. In this study, an advanced optical stimulation of in vivo peripheral neural is demonstrated tissues based on pulsed infrared light and gold nanorods. In order to present that a pulsed infrared stimulation elicits a neuronal stimulation, we measured compound nerve action potentials (CNAPs) from in vivo rat sciatic nerves using male Spraque-Dawley rats aged 10 weeks. The animals were prepared to have gold nanorods (GNRs) injected around the nerve tissues as depicted in Figure 1. While both groups of animals with/without GNRs showed evoked CNAPs under identical laser exposure of 0.641 J/cm2, larger neural responses were produced in the presence of GNRs by more than 6 times. This clearly demonstrates that laser energy is delivered to the target tissue more effectively through its conversion to local surface plasmon (LSP) modes excited by GNRs and the resultant local heating initiates more number of neurons to be activated. In addition, the decrease of threshold level of laser power was critical to avoid the tissue damage around the exposed nerve tissue as shown in the Figure 2. The platform proposed in this study can provide a significant improvement in terms of a neural responsivity and a stimulation threshold level, therefore reducing the requisite radiant exposure and the concern for tissue damage. It is expected that the proposed plasmonic stimulation could open up new possibilities for applications for non-invasive investigations of diverse excitable tissues and treatments of neurological disorders. ​(a) Compound nerve action potentials (CNAPs) recorded from a rat sciatic nerve in vivo. CNAP curves recorded when a laser pulse with an exposure energy of 0.641 J/cm2 was irradiated to the target nerves with and without gold nanorods. (b) The nerve irradiated at the stimulation energy of 0.956 J/cm2 does not show any evidence of thermal damage. Enhanced infrared neural stimulation using localized surface plasmon resonance of gold nanorods.